I’ve not yet confessed to the blogosphere my crazy-Christmas-love—my manic obsession with all things Santa and Baby Jesus—the tree, the stocking, the twinkling lights. 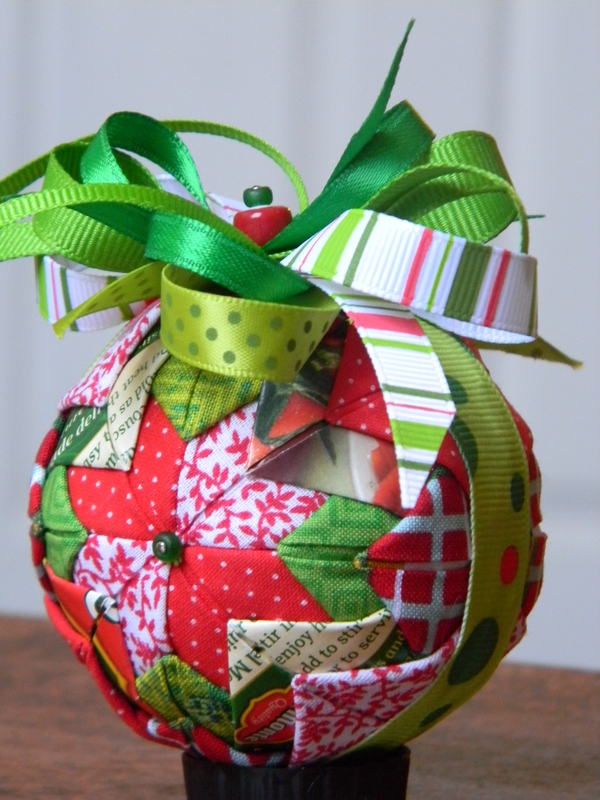 You may have guessed a bit about my holiday hysteria when I shared photos of the ornaments I’m making—quilted, two-inch squares of found paper and fabric, folded with straight pins and wrapped into balls. However, I’m crafty about Christmas in other ways, as well. 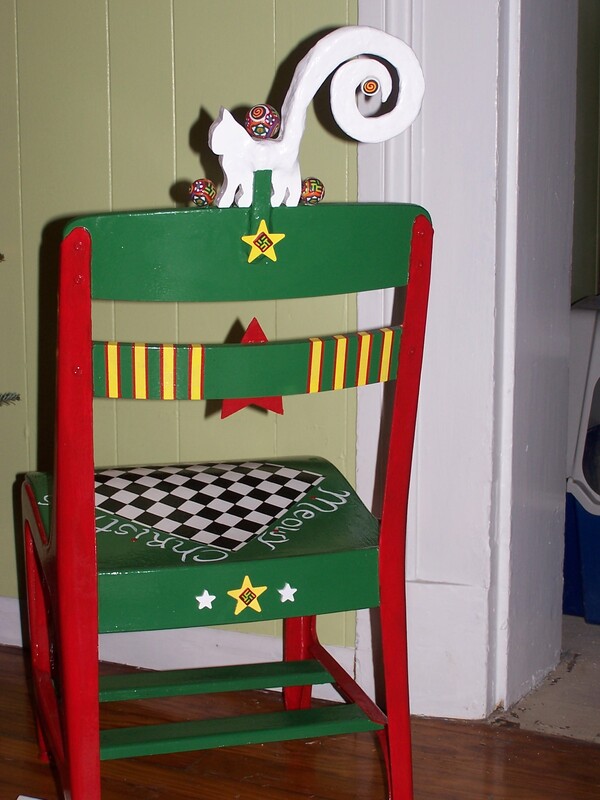 And since I’m repurposing discarded and found furniture this week, it seems a perfect time to share photos of a child’s classroom chair I transformed several years ago. 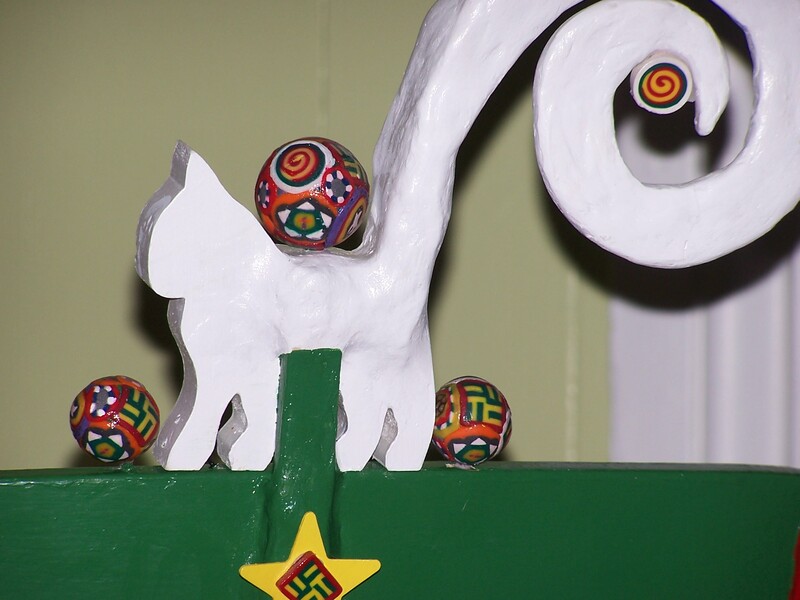 I call the piece “Meowy Christmas,” since it uses cat images to communicate its happy, holiday message. 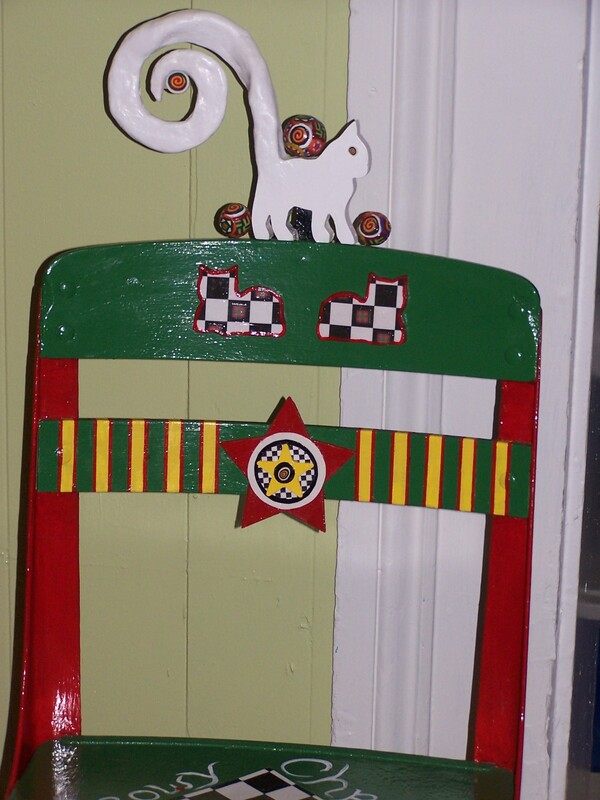 Ultimately, I donated the chair to the Lexington Living Arts and Science Center, where it was sold at a fund-raising event. Clearly, I’m crafty about Christmas and crazy for an opportunity to create “special” from scratch. I love to make meaning, and even love, from what other people scrap. What do you do special for the December holidays? 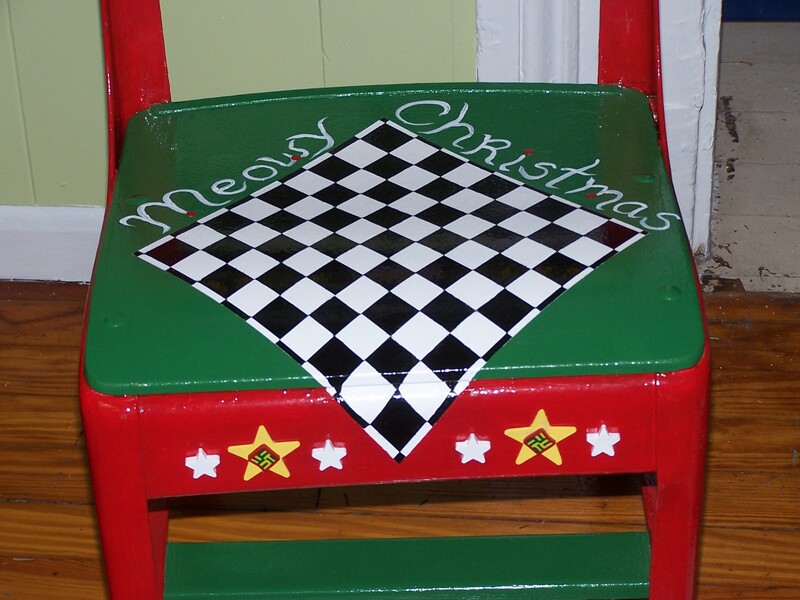 This entry was posted in art, Holidays, home, mixed media, pets, sustainability and tagged art, cat, chair, Christmas, crafts, diy, holidays, home, mixed media art, ornament, pets, postaweek2011, recycling, repurposing, sustainability. Bookmark the permalink. Thanks so much for reading and taking the time to comment. I know it’s funny to be writing about Christmas in August. I can’t seem to help myself. Maybe you understand. I hope you will stop by again soon. It was great hearing from you! Thanks, Renee. How fun that you enjoy my work. 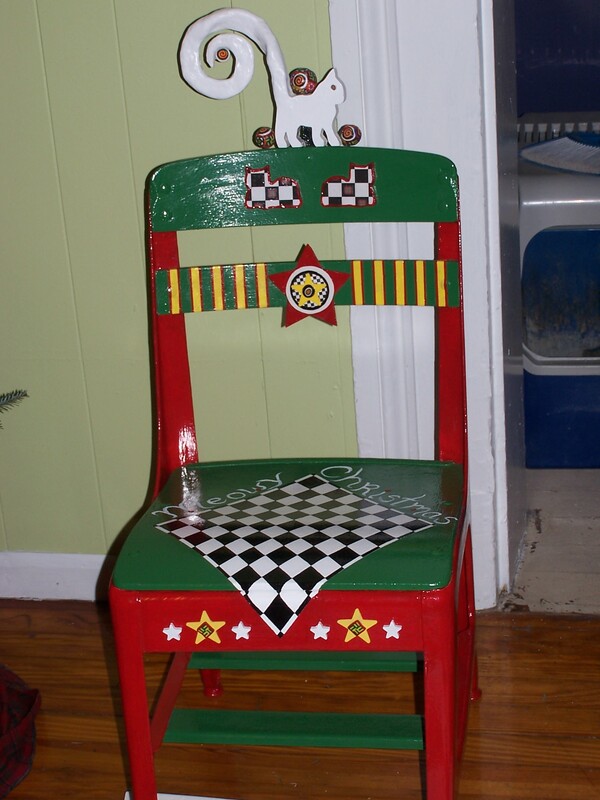 The chair was a lot of fun to create. 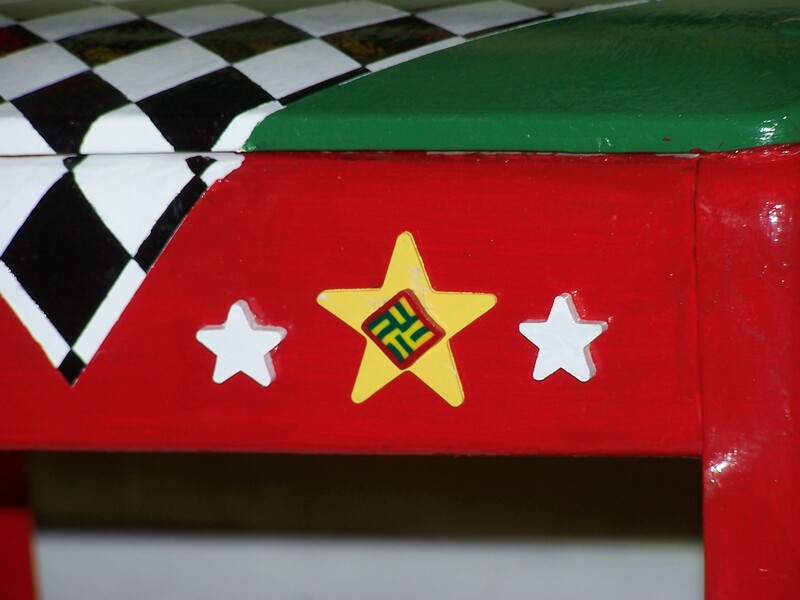 And now that I’m working on the round table I found along the road the other day, I’m remembering even more how exhilarating it can be to transform trash into something bordering on art. Thanks, Munira. I think the Living Arts and Science Center is a great cause. And, yes, it did come full circle–in a wonderful kind of way–so true! 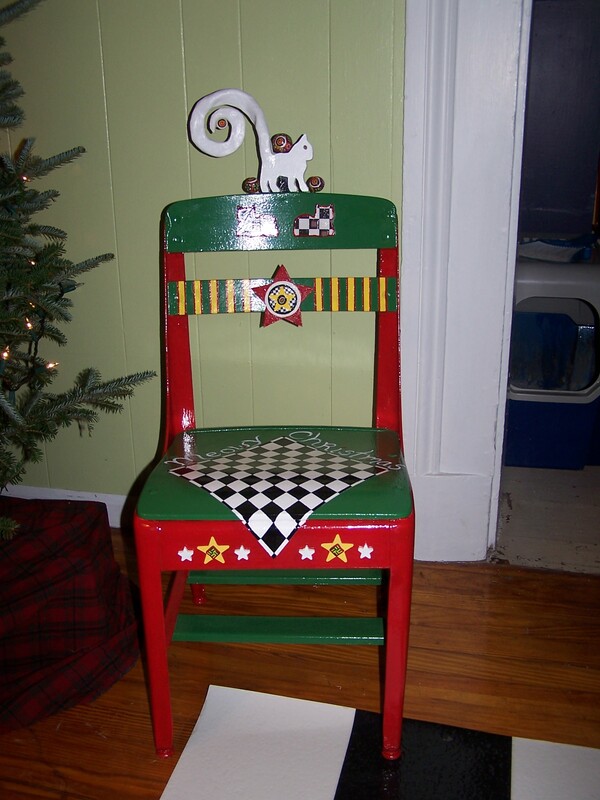 Love that you donated the chair…really enjoyed seeing the photographs of the art that you’ve created. Thanks so much, Charles. I’m pleased you enjoyed the photos! 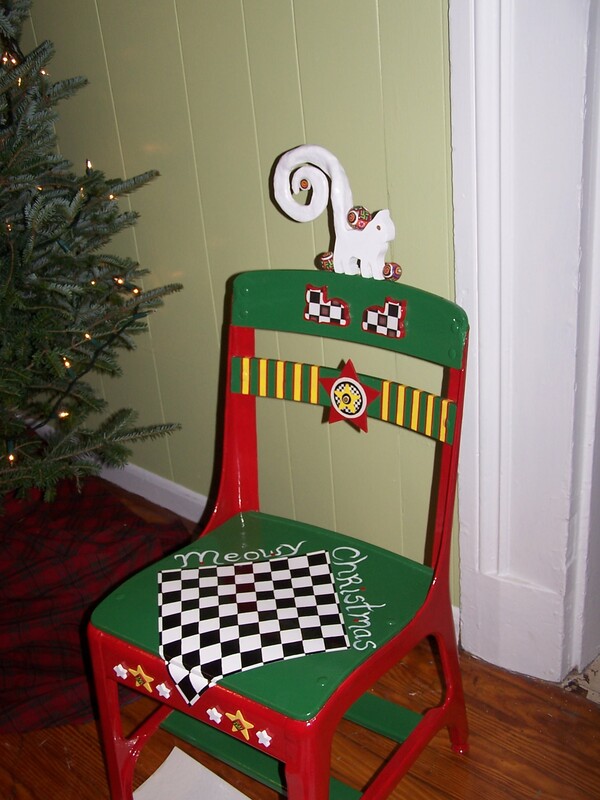 It was so much fun creating the chair! Your talent amazes me. Seriously. Oh, question: how do you turn scraps of paper (Jimmy Carter programs, wrapping paper) into fabric? Maybe you can address that in your next blog post? Great quesion. 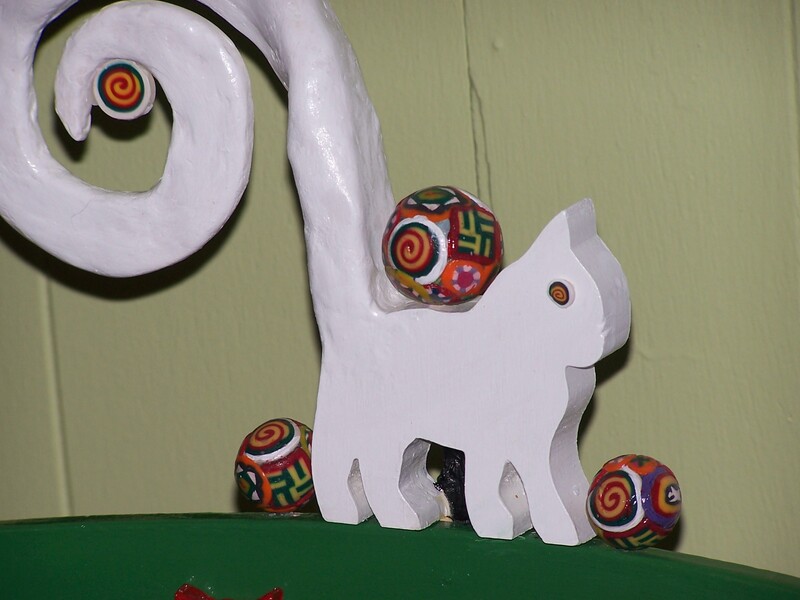 Some of the ornaments, however, actually incorporate both fabric and paper. The paper is more delicate and has to be worked with more carefully, but it works. The Carter invitations are only used on the table–not on the ornaments. Does this answer your quesion? Or is the paper just mixed in with the fabric? I can’t tell. I know nothing about this stuff! Yes, I mix the fabric and paper on the same ornamments. You are so incredibly creative ! I wish I could make something or even draw! I have to confess that I can’t draw either–like at all. Nothing that looks anything it’s supposed to look like, at least. That’s why everything I do is abstract. Thanks for thinking I’m creative! That is a FABULOUS chair! And your ornaments must take a level of patience I could only dream of. But cookies are one of the best parts of Christmas, so the ability to do that well is essential to holiday baking! I’m so pleased you like the chair. It was a fun project, for sure. Thanks, my friend! I’m a Samhain (Halloween) gal myself. I save creepy vintage photos (no, those folks never knew they were creepy when the photographer snapped the picture) and look for etherial junk all year. Fabulous chair. I love the polymere beads. I’m not not nearly as into Halloween. But I do love thinking all year round about Christmas. I’m so glad you like the chair–and the beads. Have you ever done anything with polymere clay? Once again, your creativity and artistic talent have wow’d me. I can only imagine what you might do with some of the “junk” I have around my house. I would probably have huge fun with what you call your “junk.” I think you would be surprized how little junk is actually junk. It all has such potential–as long as you actualize that potential. If drives Sara crazy if I don’t do something with the things I save from landfills. I don’t like cats, and you’ve gone and made me want a cat chair in my house! Too cool! Cool, my friend! 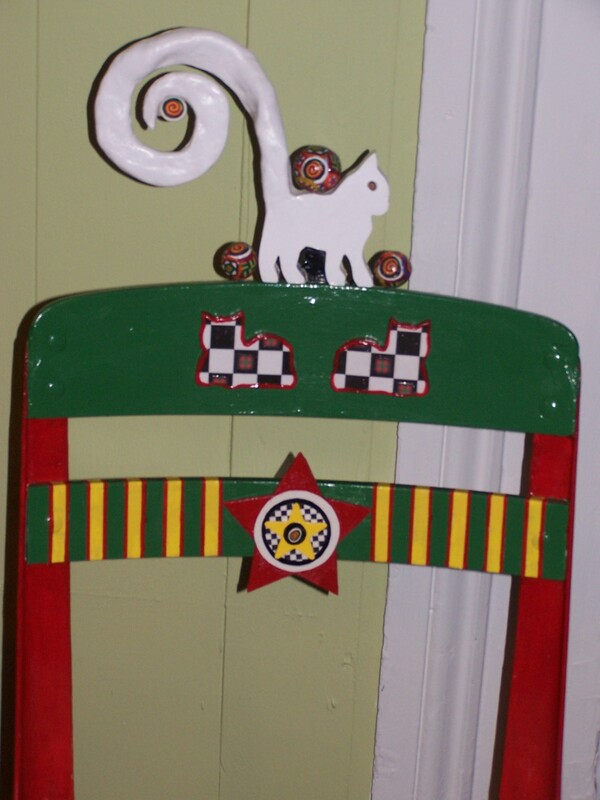 How fun that even a non-cat-lover would appreciate my chair! Halfway through the post I had to check the date to confirm what month it was. I really loved Christmas as a kid but I think I wore out the novelty with overuse. I think we should only celebrate Christmas every two years to reinvigorate the holiday with novelty. I know, Paul. It’s pretty bad to be writing about Christmas in August! I can’t disagree that we need to renew the way we think about Christmas, but it would kill me to only celebrate it every two years. Alas———————- Great o hear from you today! Thanks so much, Jackie! I’m so glad you like the ornament. They do take a crazy amount of time to make–way too much–but often making them relaxes me. 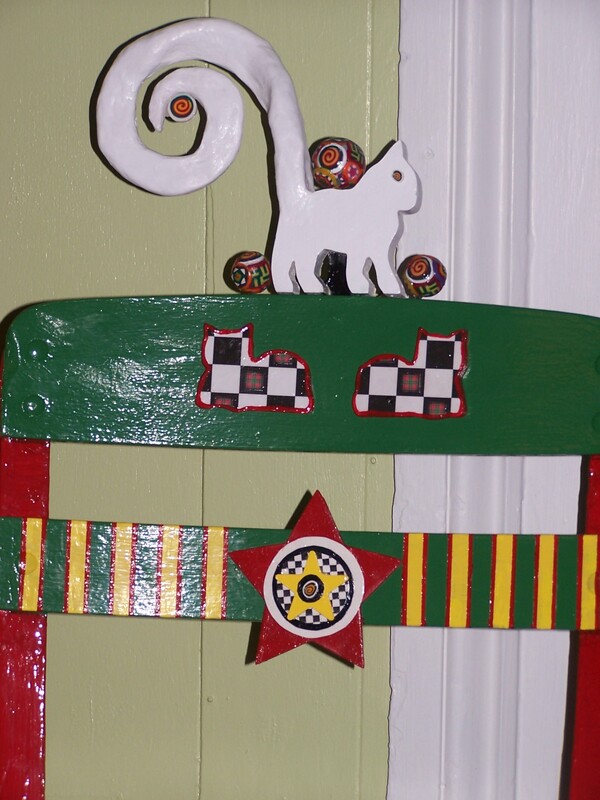 Love the cat on the back of the chair detail! You must be constantly creating new things. I kind of go in spurts. Periods with tons of creating, and then dry spells. I kind of wish I knew why it happens that way. But, yes, compared to most people, I am “constantly” creating new things. It makes life more fun, somehow. I’m so glad you like the cat. Do you think your Lucy would approve? I’m so pleased you like the ornaments. I don’t think they are difficult–just tedious and time-consuming. I’m impressed that you have finished your cards! Good for you, my friend! Thanks so much for reading!